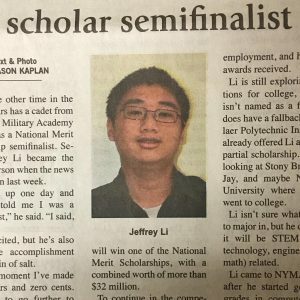 NYMA is proud to announce that Cadet Jeffrey Li (class of 2018) was selected as a National Merit Scholarship Semifinalist; an honor given to approximately 16,000 students across the country out of a staggering 1.6 million test-takers. Selection of these semifinalists is based on the student’s test score on their PSAT/NMSQT. To become a finalist, he will submit academic information, receive a recommendation from a school official, and write an essay. Good luck Jeffrey! Next Next post: The New NYMA.org is Here!